A Family Affair: The Proposal is now available. 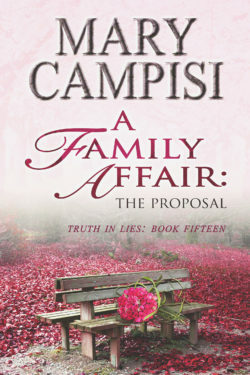 A Family Affair: The Proposal, Truth in Lies series, Book 15. It was only supposed to be a simple arrangement—until emotions got in the way. Now lies and secrets could destroy everything. Lawson Carlisle, the ostracized black sheep of the wealthy Carlisle family is back in Magdalena. It’s been sixteen years since he left, vanishing one night amidst speculations that included jail time and detention homes. Ava Marie Ventori used to believe that doing good and following rules would gift her with the life she wanted, the man she loved, the dreams she didn’t even know she craved. But her eagerness to find that perfect life landed her with the wrong man, the wrong career path, and the wrong dreams. After a chance encounter with former classmate, good-girl Ava Maire Ventori, Law offers her the use of his cabin—no strings attached—so she can work on the mystery art she obviously doesn’t want to share. But his “no strings” good intentions are no match for old-fashioned attraction… When lies and old secrets threaten the couple’s happiness, will their love be strong enough to fight for a life together?